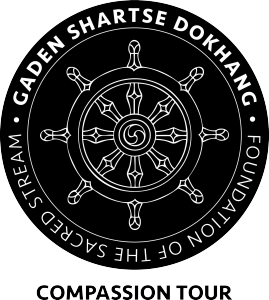 The monks of Gaden Shartse Dokhang Monastery are master sand mandala builders. Individuals, museums, Universities, corporations or other entities can sponsor the building of a sand mandala. Corporations or individuals can sponsor the building of a sand mandala at museum, school, church, library, etc. We are happy to find venues for interested sponsors. Please note that mandalas can be made for permanent display, please contact us for more info. We are relying on the generosity of many people to help us meet our goal of 1.2 million dollars to build the monastery dorms, prayer hall and medical facilities. All donations are tax deductible. Individual and corporate sponsors will receive a prominent listing on our website with contact information and/or website link, a donation letter for tax purposes, and our undying gratitude.